I’ve become known over the last 30 years for my life-like animal sculptures. Each is handmade in England and sculpted here in my studio in Wales. For me, my practice is not simply about capturing the animals I sculpt with marks and movement. It’s about our relationships with those animals and their welfare. It’s wonderful always looking at and working with a subject that I love. I’ve sculpted since I was a child, and I’ve found throughout my life that expressing animals in clay is an evolving struggle of exploration and respect. I’ve lived with exotic birds, sheep, rescued fighting cockerels and snakes, and during my seven year apprenticeship worked with countless animals sculpted by my parents, sculptors Lorne McKean FRBS and Edwin Russell FRBS. Later, my love for animals led me to volunteer with Riverside Wildlife Hospital. So although I’ve done many commissions of people, and even authored a book ‘Modelling and Sculpting the Human Figure’, I’ve always intrinsically been an animal sculptor. I’m always asking myself, how can I use my work to better the lives of animals? How can I support nature, natural habitats and welfare through my art? I raised £20,000 for Battersea Dogs and Cats home with my sculpture, and now my art raises awareness and money for the Dogs Trust, the David Shepherd Wildlife Foundation, All Creatures Great and Small, and Doris Banham Dog Rescue. In 2015 I refocused my time away from my role as Principal of an art college, back towards my practice as an animal sculptor. That year my mother Lorne sponsored my first garden at Chelsea Flower Show. The stand incorporated plenty of wild, naturalistic planting, with Foundry Bronze and Bronze Resin animal sculptures nestling amongst the pinks and greens. That was also the first year that my partner, Charles, got seriously involved with my artwork. It was the first time he set up a show, erecting fencing, welding plinths and then digging in the garden alongside garden designer Ben Cracknell. Together, the four of us put together a beautiful show garden to showcase a mixture of outdoor and indoor animal sculptures. In 2018 I’m embarking on another series of gardens, this time not only at RHS Chelsea Flower Show, but at RHS Hampton Court, RHS Chatsworth and RHS Cardiff too. My work is on show at Pashley Manor Gardens, Cotswolds Sculpture Park and Court Robert Arts sculpture garden. But I’ve got my mum to thank for the support she gave my at that first show, since, and all through my life! Apprenticing for seven years under my parents was a choice that I made because I so wanted to be an animal sculptor. I look back at the demanding training knowing it equipped me with the technical language that allows me to express myself today. I travelled across the world to help to see my parents’ large public sculptures installed. 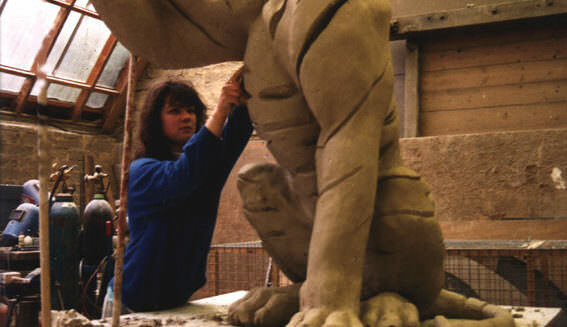 And at home I worked on animal sculptures of all sizes, from great tigers, to thoroughbred horses, to little rabbits. I learned more with them than I can easily express here. But with the support of a family and friends, I was able to step out on my own as an animal sculptor. I moved into a flat, and looked after a series of animals. Monty the python was paralyzed, and I used to carry him round with me to give him the best quality of life that I could. I also had a chinchilla named Chilli, and a parrot, named Parry. (Yes, looking back I wonder!) While it was a happy time for me, I reflect now how much things have changed for the better – for animals generally, but especially for exotic animals. I’ve realised now that love alone isn’t enough to preserve their welfare. Too often it’s our ignorance that harms them. But then I remember how far we’ve come, from capturing wild animals for display in our circuses and zoos in my living memory, to wideranging animal protection legislation and international habitat and species conservation efforts. As an animal sculpor, I now sculpt to help us continue this amazing work. I spent 2 years setting up, then 18 years growing The Art Academy. It’s also where I met my partner Charles, who’s supported and worked with me ever since. I always aimed to find a way to teach art that was intensive and skills focused, as well as conceptual. We provided almost twice as much teaching as the average in UK universities. I was incredibly proud to see new generations of enthusiastic and talented artists graduating each year. It was a long, hard road, setting up a charity and pushing it forward. When I left we had 170 students on long courses (lasting a year or longer) and 2,500 on short courses. We had five buildings in Central London, and the work produced by our wonderful students was outstanding, winning prizes and commissions. In my final year we successfully partnered with The Open University, who validated an amazing new BA in Fine Art that would begin in 2018. It was a lovely note on which to leave, to pursue my practice as an animal sculptor again full-time. 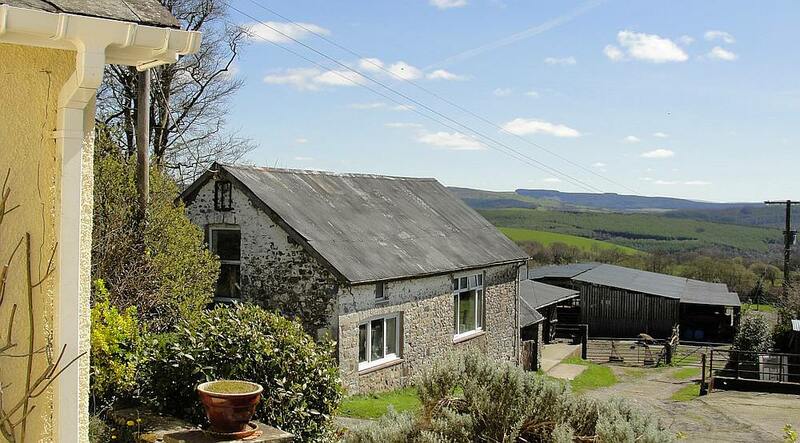 I now live in Wales, on a farm called Moelfre. It’s named after the ‘bald hill’ it sits beneath, and it enjoys views over a lovely welsh valley and the Black Mountains. I’m so lucky to have found it, not just for its beauty, but for its custom-built sculptor’s studio. Moelfre was once home to painter and animal sculptor Robert Clatworthy. He’s now sadly passed away, but I have him to thank for my perfect studio. It’s large, far larger than the small sitting room I used to do my sculpture in. I have space for very big commissions, and room for all the elements of the practice. Charles works in the workshop beside my studio to build my backirons, or in the office working with me to run the business. He’s even started writing in his spare time. My two beautiful dogs, Asha and Zena, are our constant companions around the farm. Now I’m truly out in nature, I can spend all my time appreciating the things I love. I have the time to truly focus on my own work as an animal sculptor. And I’ve reconnected with the animals that have always formed the core reason for my making art. So it’s been a happy journey, and I look forward to what’s ahead!